Kia Ora! 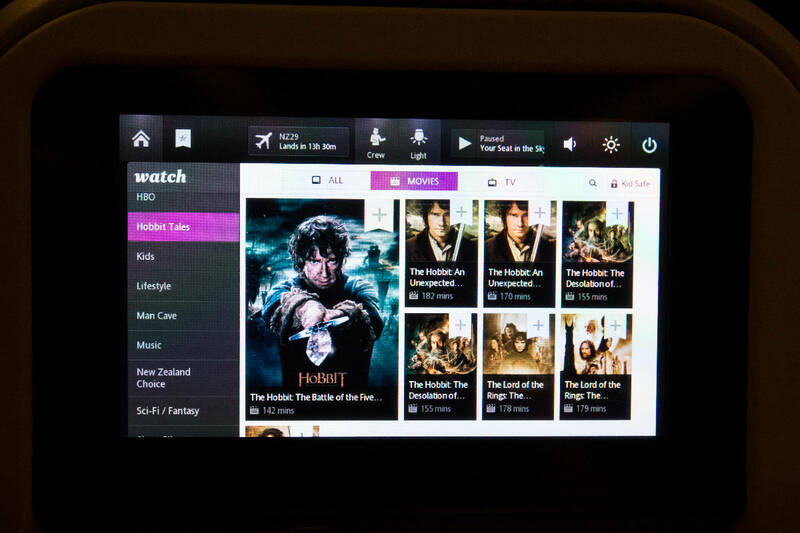 There is only one airline in which you will find “Hobbit Tales” listed as a genre from which to choose on your entertainment system. Any guesses? Only on Air New Zealand, of course! 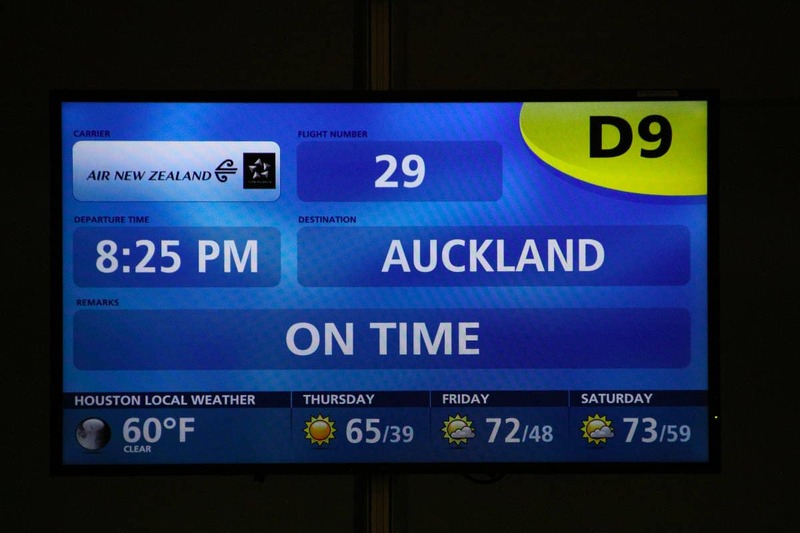 After taking a flight from LaGuardia to Houston, we boarded our second plane directly to Auckland, New Zealand. We took off right on time, and before we knew it, David and I were actually en route to New Zealand! Air New Zealand got major props from the Gallo family, as their safety video was actually watchable and entertaining. Why? They described the process through pro surfers – Mick Fanning, Alana Blanchard, Laird Hamilton, and Gabriel Medina – pro surfers that we have followed for years. Upon seeing their faces on our screen, we instantly tuned in and laughed about how they ended up in our safety video. 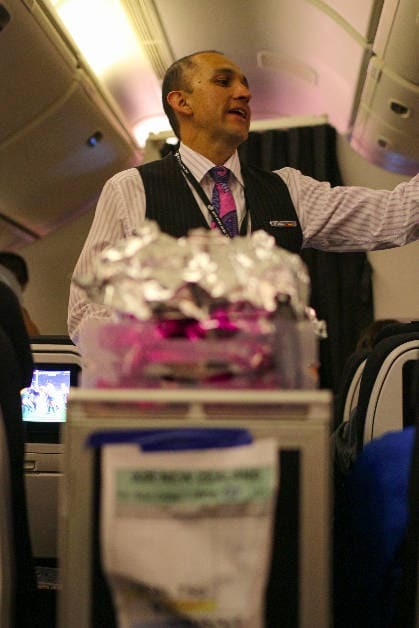 As soon as it was safe, the flight attendants came through offering glasses of water prior to the “real” beverage distribution. Since I was absolutely parched, I was quite pleased. 30 minutes later, dinner was delivered. I was served a white bean and pesto salad, chicken and steamed vegetables with rice, cheese and crackers, a warm roll, and strawberry cheesecake for dessert. As far as airplane food goes, Air New Zealand nailed it. The lady next to me loved her beef casserole too. 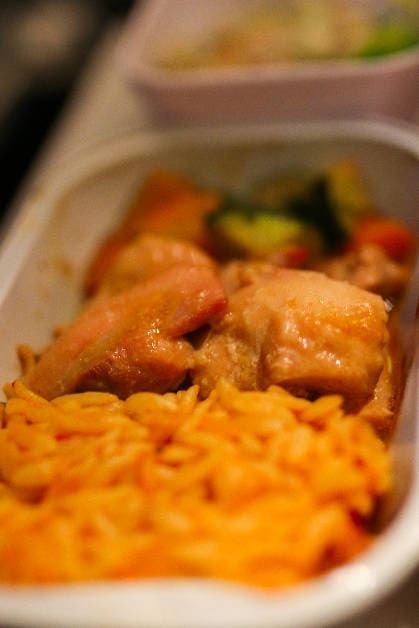 5FT Tip: It is important to note, however, that if you want a vegetarian dish that it needs to be pre-ordered as it is not an option once already onboard. David was lucky, and the staff happened to have an extra vegetarian meal for him after they went through serving everyone else. Phew! While the food was good, my favorite aspect of the meal was the wine. Economy class offered New Zealand wine free of charge, with an option of red or white. I didn’t hear the white wine choices, as I opted for red (I’m a red wine girl! ), but I was given the choice of Pinot Noir or Merlot. 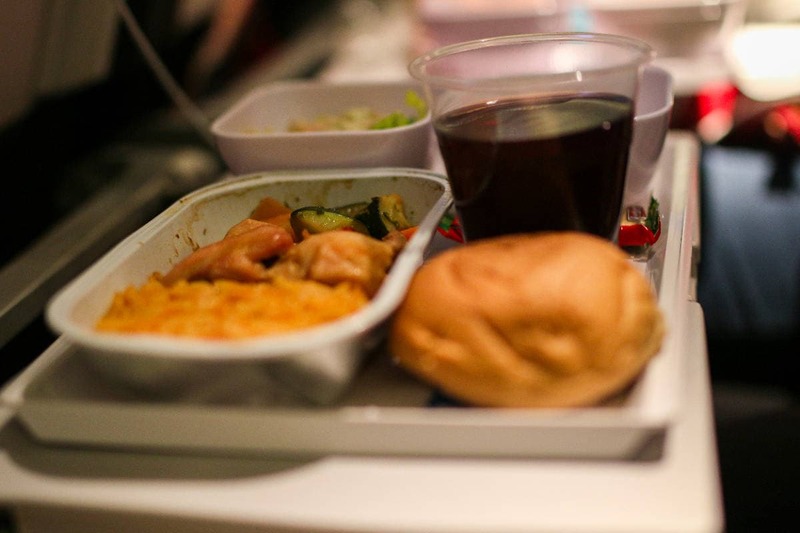 Having a glass of pinot with my meal was not only enjoyable, but always good for calming in-flight nerves. Here’s the best part: about forty-five minutes later, the flight attendants came through the aisles again, each with two bottles of wine in their hands, encouraging us to refill. Uh, yes please! After dinner, people began to settle into place for relaxing and/or sleeping. I observed two fabulous Air New Zealand commodities. Firstly, Air New Zealand provided a fantastic entertainment system – whether you wanted to track your flight with Google Earth technology, charge your phone or other electronics with the USB port, play a game against your seat partner, listen to some tunes, or become absorbed in a movie, Air New Zealand had it all. Granted, we were on a fourteen hour flight, so it’s always that much more appreciated when you know that you’ll have even more ways to occupy that time. 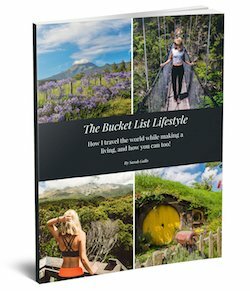 More than that, when searching through the movies, I noticed that not only was the drama category stacked, but they had an entire genre entitled “Hobbit Tales.” Within the “Hobbit Tales,” one could watch both The Hobbit and Lord of the Rings Trilogies. Looking for a way to distract yourself for the whole flight? Now that would be quite a way not only to blow time, but to prepare yourself for New Zealand that much more! Secondly, they have economy skycouches. 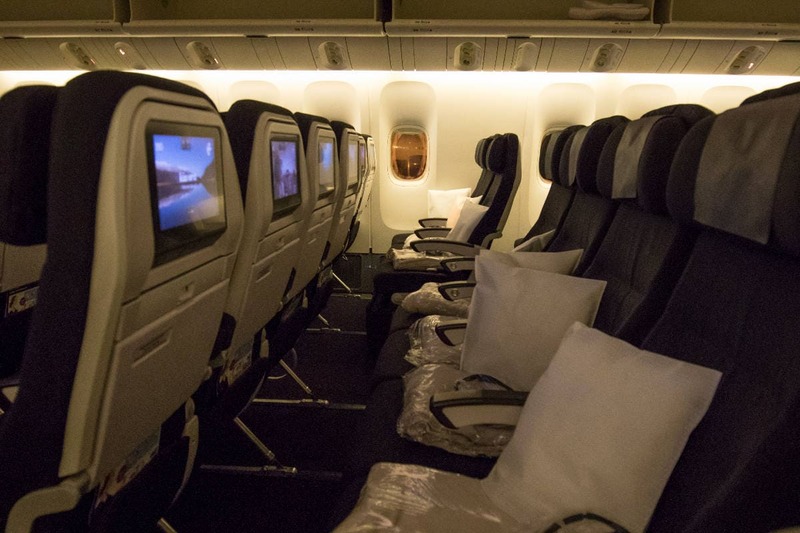 Yes, beds in economy – you no longer need to be in first class in order to lie down! If you’re lucky enough, you may be assigned a row that can turn into a full-on twin bed. David and I weren’t so lucky, but the couple next to us were able to convert their row into a bed for a nice fourteen hour snuggle sesh and sleep. How comfortable?! 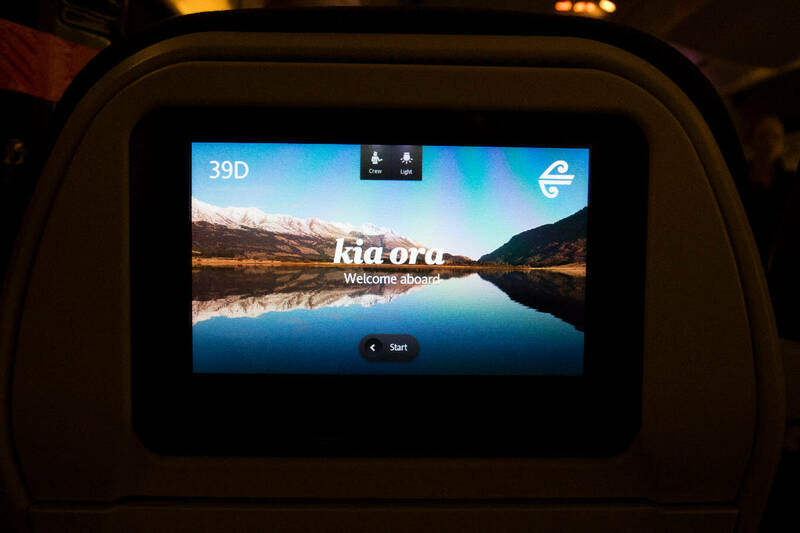 I can’t stress enough just how much Air New Zealand’s newest skycouches are a game changer in the airline world. We dozed a little bit on the flight, and before we knew it, breakfast was being announced at 4am. We were given the option of cold or a hot. The cold option consisted of a healthy serving of fresh fruit salad, a nice-sized apple cinnamon muffin, and a yogurt. As I’m allergic to apples, and many other fruits, I opted to go hot. I was served a cheese omelet with hash browns and a tomato, of which I was very pleasantly surprised, a blueberry yogurt and a small fruit bowl. While I opted for water as my beverage of choice, I did notice that they were offering sparkling wine with breakfast for you ladies that have a 4am craving for mimosas! Unfortunately, we were both half asleep when breakfast was being served and completely forgot to take a photo! Our flight as a whole was incredibly smooth. There were very few occurrences of turbulence, and the pilot was always sure to keep the cabin informed as to what was going on. Thanks to a combination of his skills and beautiful weather, our flight really couldn’t have gone any better. We even landed half an hour early! A very big thanks to Air New Zealand for making this trip possible for us! **Special thanks to Air New Zealand for sponsoring our journey. As always, all opinions are my own. Photographs taken by David M Gallo Photography. Sounds like an awesome airline. You had me at edible plane food but the sky couches sound AMAZING! 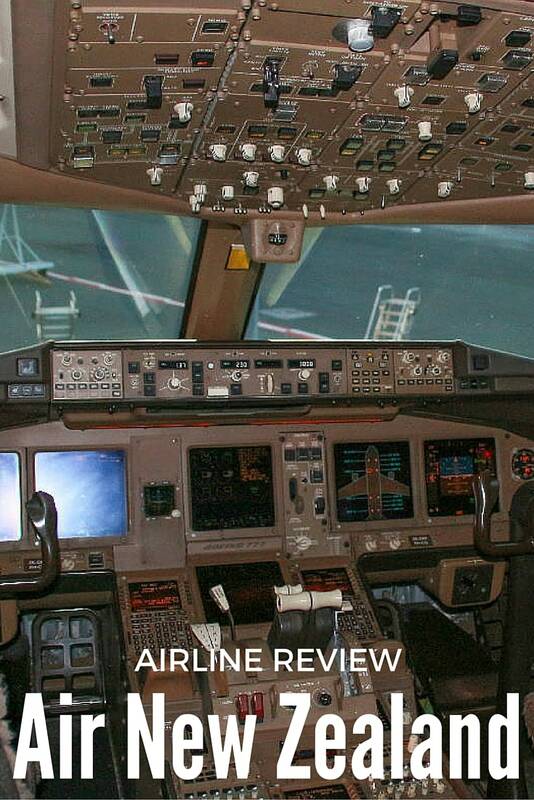 I have to agree, their safety video is awesome! Other air lines could take some notes. In February 2017 we flew Air NZ from the Gold Coast Australia to Fort Lauderdale via Houston and overall the 3 flights went like clock work. In the 14hr long haul leg from Auckland to Houston my husband and I purchased 3 sky lounge seats. These are not free and no luck was involved as the critique above seemed to imply. The sky lounge seats are better than economy seats only for the fact they provide individual seats with adjustable lower leg support. When all 3 seats are set to extended “bed” mode there is absolutely no way 2 adults over 5’6″ can possibly lay down simultaneously even in feotal position. The best way to use them as normal sized adults is individually with the leg support extended. Food was decent, wine and spirit service good. 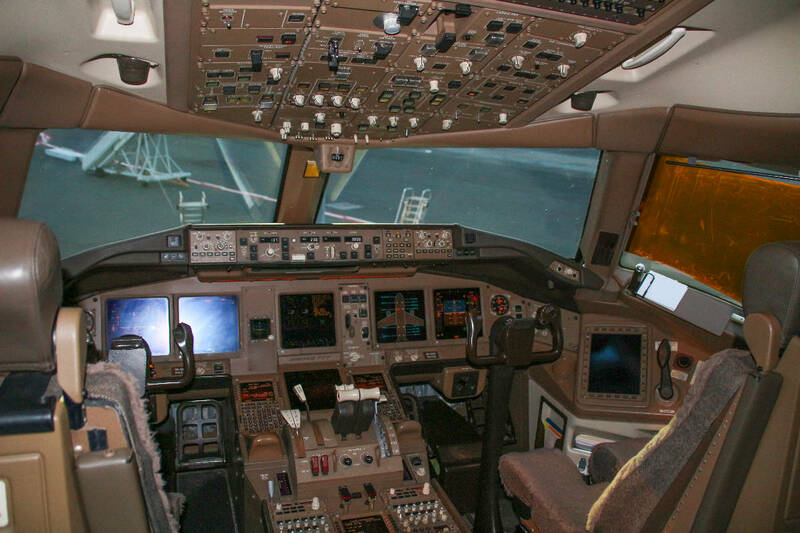 The best secret I discovered was midway into the night flight when no cabin crew are visible. In the entertainment unit there is a food and beverage order App and I just tapped icons of the items I wanted and within 5 minutes an attendant delivered them. 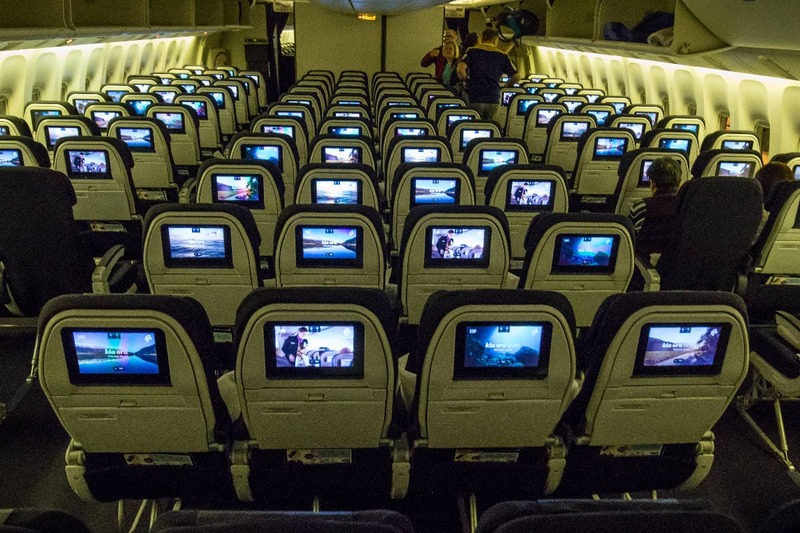 It’s a really cool way of doing cabin service. I’m crossing the Pacific again in 3 weeks to Philadelphia and choose to fly Air NZ but this time in premium economy without the husband.